Beautiful and precious little faces! I agree with your comments on parents spending time with their children. I think your photographs are outstanding, but I can’t help feeling you may have overdone it with sharpening. Is it intentional to deter copyright theft? @jonathan, thanks for your comment. I think you are right on some of the older photos, which were prepared on a different monitor. When seeing them again on my new monitor they look a bit oversharpened as well, strange how much influence the monitors have! 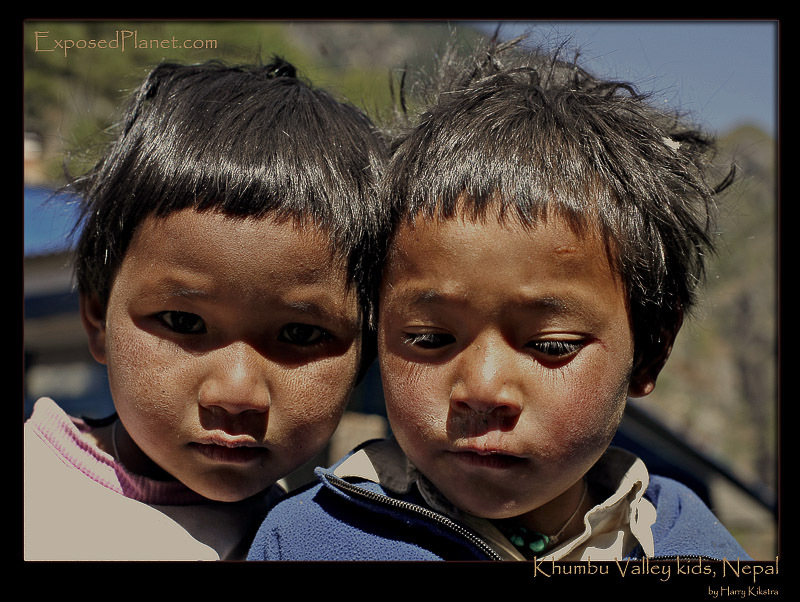 The story behind "Khumbu Valley Kids, Nepal"
According to the signs thousands of trekkers enter the Sagarmatha national park every year. But still these kids seemed totally amazed to see me enter the park gate opposite their house. They like to say hello and shake your hand, and might ask for some sweets or even money, but they are never annoying or rude or aggressive as their western counterparts many times are. Maybe the parents over here should learn to relax a bit more and spend more time with their kids instead of handing them out to daycare centers the moment they are born?